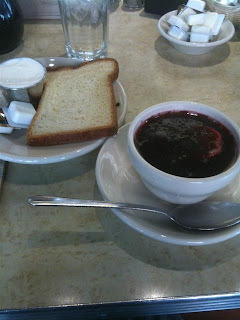 Right before Mr. T and I travelled to Westchester for our holiday celebration with his family, I stopped by Veselka to try out their special Christmas Borscht. I grew up enjoying my grandmother’s version every year but I have yet to find one in the city as perfect as hers. Veselka’s regular borscht came the closest in flavor so I was excited to try out this version and see how it compared. My walk over to Veselka was absolutely freezing! By the time I got inside I was dying for something warm and soothing. I took a seat at the counter and ordered myself a cup. Within minutes I had a steamy hot cup in my hands. The wonderful aroma of fresh beets and dill was absolutely intoxicating. I couldn’t wait to dive right in. Look at this beautiful ruby color. This soup was packed with chopped pickled beets and little dumplings filled with dried mushrooms. 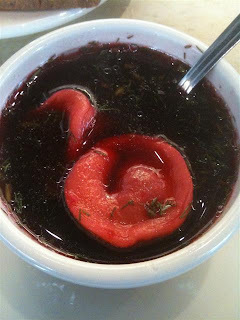 This was a Christmas Borscht! There was so much flavor going on in the soup- sour, earthy, sweet. If you’re not a big dill fan than stay away but for me this soup was awesome! I was so happy! The addition of a dollop of sour cream completed my lunch and I felt extremely comforted and satisfied. This was an excellent way to start of the week long holiday vacation filled with tons of good food and family. Get some before it's gone!